What are fertility, fecundity and viability? Fertility would not be without fecundity and viability. Their interaction will become apparent in the text that follows, but let me first define these terms. Fertility is a measure of reproduction: the number of children born per couple, person or population. In all species, fertility displays astounding mechanisms and depends on many factors such as nutrition, sexual behavior, instinct, endocrinology, timing, way of life, and emotions. Human fertility is a little more complex as economics and culture are also added. Fecundity, derived from the word fecund, generally refers to the ability to reproduce. In biology and demography, fecundity is the potential reproductive capacity of an organism or population, measured by the number of gametes (eggs), seed set or asexual propagules. Viability means in general “capacity for survival” and is more specifically used to mean a capacity for living, developing, or germinating under favorable conditions. In pregnancy, viability refers to either an early stage pregnancy that has a chance of reaching full-term and live birth, or the shortest length of pregnancy after which a new born prematurely has a chance of survival. During several animal research projects sponsored by the former Russian Academy of Science and Ministry of Nutrition, the effect of BAC on fertility, fecundity and viability was evaluated in small and large species. Some of these trials were very large, comprised of thousands or even millions of animals. Overall, when consuming BAC, most species were observed to be more energetic, to have more vitality, and to have increased energy and strength. From the hundreds of resulting health and productivity benefits, I will concentrate on those having to do with fertility, fecundity and viability. Dog: In this informal study, hundreds of dogs, the majority being German Shepherds, were observed over a period of several years. The dogs were used in Moldova to guard the poultry research farm from foxes and other predators. In other clinical research conducted at the University of Hawaii, spirulina caused the fertility levels of quail to increase to 96.1 %, significantly higher than fertility levels on a standard breeder diet. In other research, spirulina was reported in many Aviaries to nearly double production of finches, canaries and hookbills. Rather than detailing the physiological mechanisms of fertility, fecundity and vitality, all of which can be found in many books, I will describe only one physiological example to illustrate the relationship between nutrition (and BAC) and fecundity. 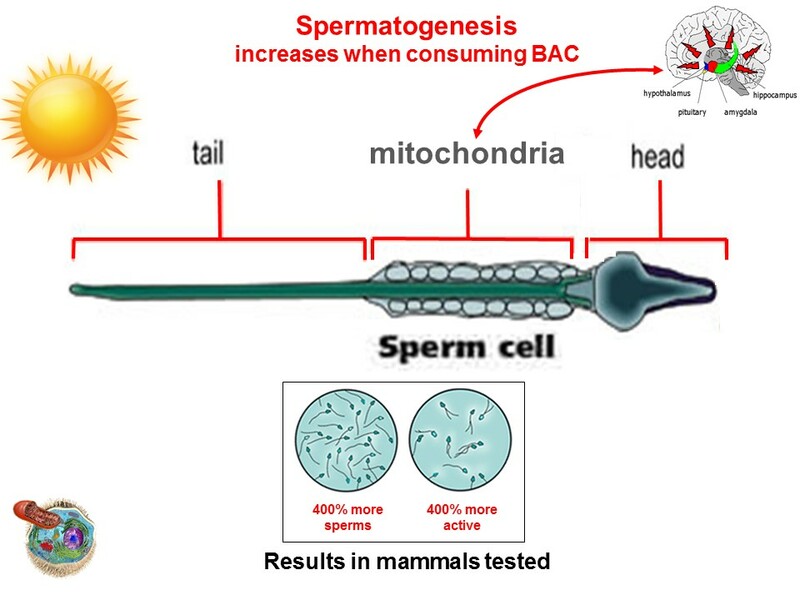 The animal research done with BAC often resulted in elevated spermatozoid count and motility across species. Spermatozoid count is a function of testosterone, cell splitting and other energy and metabolic factors. Motility is a biological term that refers to the ability to move spontaneously and independently. In terms of fecundity it describes the capacity of the sperm to reach the egg. One partial explanation of these results is associated with increased ATP energy resulting from a better mitochondria Krebs cycle metabolism. By looking at the structure of a spermatozoid, you can understand the importance of energy required for its flagellum to propel it towards the egg. The key to spermatozoid motility is in its middle section (see diagram). This middle part, immediately behind the head, contains numerous mitochondria, which generate the energy required for movement of the tail. Mitochondria are tiny sausage-shaped organelles that float in the cytoplasm of the cell. Besides being abundant in the spermatozoid, there are trillions of these tiny powerhouses in the body. Mitochondria are present in all human and animal cells and play a central role in sustaining aerobic cellular energy functions. In the body, the cells that require the most energy contain the most mitochondria. The cells of the brain, skeletal muscles, heart muscles and eye contain the highest number of mitochondria (as many as 10,000 per cell) while the skin cells, which do not require much energy, contain only a few hundred of them. Mitochondria look and function like “tiny energy capsules.” They carries ATPase, which is the principal energy enzyme, and cytochrome enzymes, which are the principal enzymes involved in detoxification. This energy molecule is called adenosine triphosphate (ATP), the principal energy molecule in the human body. ATP molecules are produced in the cells by the oxidation of carbohydrates, proteins and fats. The energy carried by ATP molecules is used or stored depending on the needs of the body. These processes are regulated by several factors including the efficiency of enzymes, the extent of enzyme inactivation by intracellular enzyme poisons and the metabolic needs of the cells at the time. How does BAC positively affect the energy capsules? When tabulating the range of health results obtained in the Russian studies, it becomes obvious that all physiological metabolisms of the body are benefited when consuming BAC. There is no doubt that BAC with its 5,000 nutrients does a magnificent job supporting a healthy cellular metabolism. Furthermore, with its high content of green chlorophyll, nicknamed the “shepherd of light” due to its critical role in the photosynthesis process, BAC significantly contributes to the energy process that occurs in thousands of mitochondria in trillions of cells of the body. But BAC’s greatest value is that it is extremely efficient at reaching the cells of the brain, resulting in the energetic awakening of the hypothalamus/pituitary cortex that is responsible for the balance (homeostasis) of all metabolisms of the body, including the critical ATP energy cycle that occurs in mitochondria.